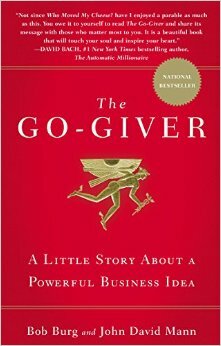 I just had the amazing time of reading this powerful book The Go-Giver: A Little Story about a Powerful Business Idea by Bob Burg, John David Mann. It is a captivating book that shines new light to the old adage “Give and you shall receive.” I highly recommend this book for those who are just starting their business, planning on starting one or even those who’ve been in the game for a long time. The Go-Giver is the story of a young man named Joe, very ambitious and determined to reach the greats, who has always been on the lookout for success. Joe is a quintessential go-getter, though he felt like the more he reaches his arms out to achieve something and the harder he plays, the farther he seemed was in getting the results he wanted . Below are some of the key points I absolutely loved in this book. Enjoy! Five Laws of Stratospheric Success. THE Law of Value: Your true worth is determined by how much more you give in value than you take in payment. – The First Law determines how valuable you are. The Law of Compensation : Your income is determined by how many people you serve and how well you serve them. – the Second Law that determines how much you actually do earn. The Law of Influence: You influence is determined by how abundantly you place other people’s interests first. The Law of Authenticity: The most valuable gift you have to offer I yourself. Lesson: find successful mentors via books, blogs, YouTube or in real life when you can. The secret of “Giving” – give more value than people pay for. In business you must give before you receive. Must make and save money before you profit from money. So make sure you have positive expectations for yourself, for others as well as for outcomes. Go looking for the best in people, and you’ll be amazed at how much talent, ingenuity, empathy and good will you’ll find. Lesson: once again change your outlook to change the outcome. Look for the positives and the opportunities you want and you are much more likely to find them. Change any negative outlooks into positive ones. Lesson: taking action in applying something you learn is the only way to change your life, your future. And habits are only formed when you take action. I look at sharing ideas with others as taking action. Otherwise what good is it to have a lot of knowledge? Underneath that jovial, bigger-than-life Italian chef persona there was a powerful sense of focus and intention. “A bad restaurant, tries to give just enough food and service, both in quantity and quality, to justify the money it takes from the customer. A good restaurant strives to give the most quantity and quality for the money it takes. “The first question should be, ‘Does it serve? This is what many of the successful people online are doing these days, they give away lots of advice and content for free and in many cases most of their content and advice for free and this leads to opportunities. What would you do for free? Give for free? THE LAW OF VALUE Your true worth is determined by how much more you give in value than you take in payment. Lesson: so if you are trying to make more money how can you server more people? This is obvious to those of us in business and is usually the question we all try to answer to get more sales. If you are a personal coach you can reach more people when you record your coaching and offer it online. You record it once and thousands or millions of people can learn from you. Survive—to meet your basic living needs. Save—to go beyond your basic needs and expand your life. This could be a spouse, an accountability partner, a business partner, parents or friends who all want to see you succeed or as the book says they always have you in the backs of their minds. And you feel the same about them. “They’re people who are personally invested in seeing you succeed, you see? And of course, that’s because you’re the same way about them. They’re your army of personal walking ambassadors. I often want others to succeed so there are other people to hang out with during the working week! So a win-win could be to help others find financial freedom so they can spend more time with you. This can be applied to a spouse as well. “Watch out for the other guy. Watch out for his interests. Watch his back. Forget about fifty-fifty, son. Fifty-fifty’s a losing proposition. The only winning proposition is one hundred percent. Make your win about the other person, go after what he wants. What creates influence? Putting other people’s interests first. Fifty-fifty’s a losing proposition. It was Sam, of course. Even-Steven. I scratched your back, so now you owe me…that’s not being a friend, that’s being a creditor. The next part of the book is when a lady is speaking at a conference, she recounts when she came to the conference as a down and out real-estate agent. “I learned something that day. When I said that my life as a mom, wife and household manager left me with nothing the marketplace wanted, I was wrong. There was something else I’d learned over those years, and that was how to be a friend. How to care. How to make people feel good about themselves. And that, my friends, is something the marketplace wants very much—always has, always will. Reminds me of the saying people will always remember how you made them feel. I’m here because I have the awesome responsibility and honor of selling you something far more valuable than a house. “What I’m here to sell you on is you. She looked to the left and to the right, again, meeting the gaze of dozens of individuals. “It’s worth ten thousand times more than all the closing techniques that ever have been or ever will be invented. The Fourth Law THE LAW OF AUTHENTICITY: The most valuable gift you have to offer is yourself. How many of us have heard it is better to give than receive? How many have taken this to heart and accepted it as true? This was very interesting to me since I’d rather give than receive, this chapter points out how that really doesn’t work. Also I realized that if you are a giver you need to only give to those who are open to receive and in many cases those who are going to receive help and multiply it with their own work. “It’s not better to give than to receive. It’s insane to try to give and not receive. “Trying not to receive is not only foolish, it’s arrogant. When someone gives you a gift, what gives you the right to refuse it—to deny their right to give? Every giving can happen only because it is also a receiving…. “All the giving in the world won’t bring success, won’t create the results you want, unless you also make yourself willing and able to receive in like measure. Because if you don’t let yourself receive, you’re refusing the gifts of others—and you shut down the flow. This makes me think of the law of attraction. If you are not open to receiving then you will not have as many opportunities to receive.